With spring just weeks away, it is time to start thinking about landscaping and lawn care. For some, this may be exciting news. For others, however, it may kick up a whole host of bad feelings and dread. Regardless of what camp you fall into, in today’s blog, we at Royal Estates Lawn & Landscape would like to share with you some reminders and things to add to your landscape maintenance checklist. If you are in need of landscaping, lawn care, mulching, pruning, or some other lawn service, the professionals at Royal Estates Lawn & Landscape can handle it. Give us a call today at 225-372-7937 to find out more or to get your free quote. To maximize the chances of having a beautiful lawn in the summer, give your lawn some serious TLC in the spring. This all starts with a thorough clean up. With the help of a rake, clean up all the dead grass, leaves, stalks, perennials, pine cones, branches, and whatever else winter left behind. Even if you don’t think you need a rake to clean up all the debris, this can be a good idea because it allows you to control thatch build-up. Also, if you have a dog, be sure to clean up all the dog poop. If you are preparing an established perennial bed that did well last year, first begin by removing any weeds. Then, mix in some additional compost around your plants. If you are building brand new planting beds, you will first begin by either using a tiller to break new ground or killing the grass by smothering it with a tarp or some other material that will block light and moisture. If you want to decrease the likelihood of weeds, lay landscape fabric over the ground and cover it with a layer of mulch. Then add your newly loosened soil. Early spring is a good time to get your perennial flowers in the ground, as well as any trees and shrubs you want to plant. For the more tender plants, you may want to hold off a few weeks—though it is highly unlikely we will reach frost-level temperatures here in Southern Louisiana. If you have yet to add some starter fertilizer or soil conditioner over the loosened soil, now is also the time to do this. After you have planted all your plants, mulch the beds and around the base of trees. Rather than waiting for weeds to emerge, get ahead of the game and start controlling them before they take over. Applying a pre-emergent application both to landscape beds and your lawn can be a great way of achieving this. Additionally, any weeds that are visible in the spring are sure to multiply and lead to even more maintenance further down the line. Any dead branches that you spot on your trees or shrubs should be removed. This is the easiest part of pruning. However, when it comes to pruning live branches, this is something that should be done by experienced professionals. While pruning is important to shrub and tree health, improper pruning can be damaging to shrubs and trees. If you are unsure about what, where, or when you should prune, contact lawn care service professionals. Spring clean up can be a big undertaking. If you need some assistance with your spring lawn care, contact us! 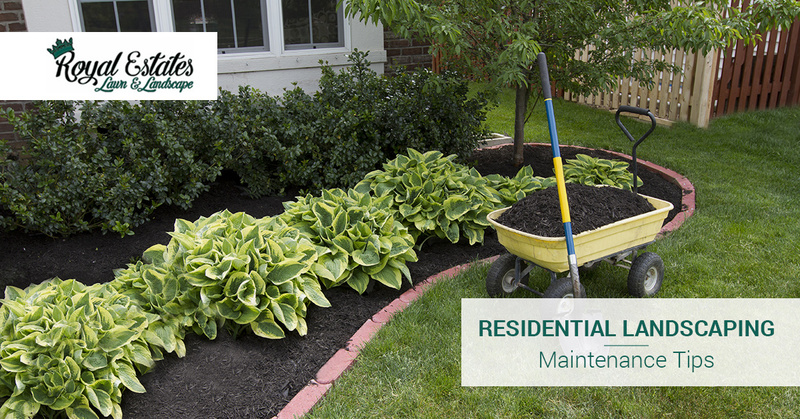 Our landscaping and lawn care service experts can handle all of your residential lawn needs. In addition to all of the above-listed tasks, we also provide aeration, seeding, irrigation services, and more! Learn about our services and call us to get your free quote!